Work, play and relax are the three important things of an active human life and almost all of you may plan carrying out these activities as per your ease and convenience. Since working in corporate world is getting much tougher these days, most of the employees face harsh words, wrong behavior, and even receive official warnings for not informing about their leaves in advance. A company and its stakeholders completely understand that an employee may have several tasks to perform, apart from professional responsibilities, and they may face health issues which makes them unable to attend work. 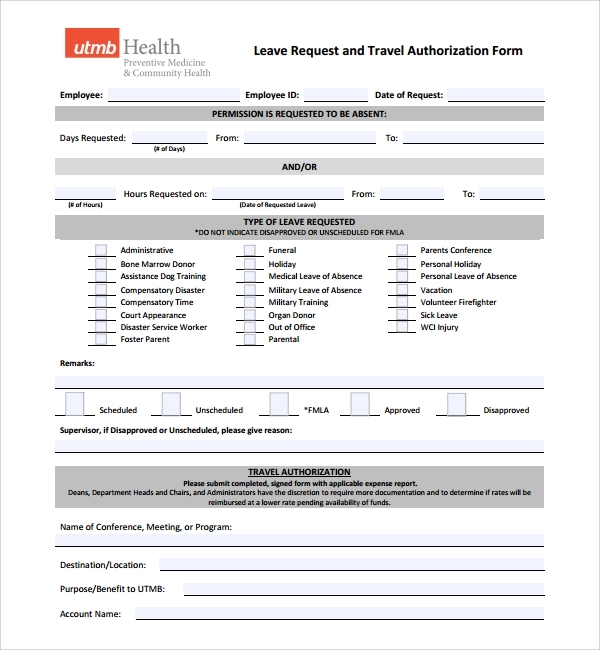 The Leave Medical Authorization Form Template serves as a ready to use document that an employer can use for authorizing leave requests in case of urgent as well as planned leave requirements. Additionally, the leave authorization form can also be used to request for a day off as additional to the existing leaves for certain special purposes. 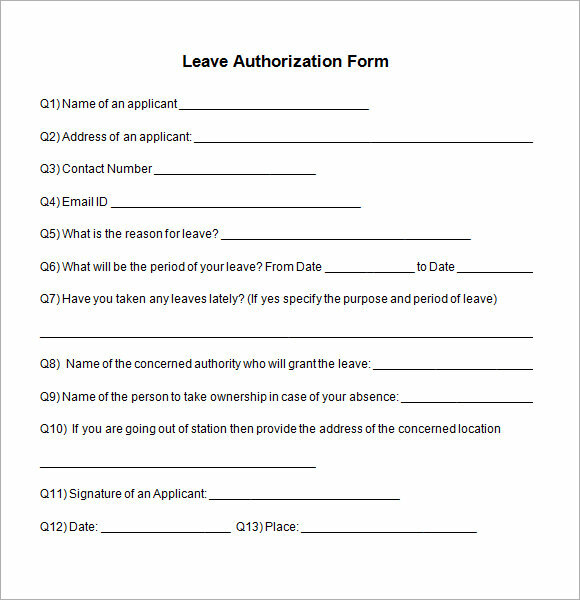 As the name suggests, the Leave Request Authorization Form Template is designed to help the managers, supervisors, or even business owners to authorize leave requests raised by their employees. 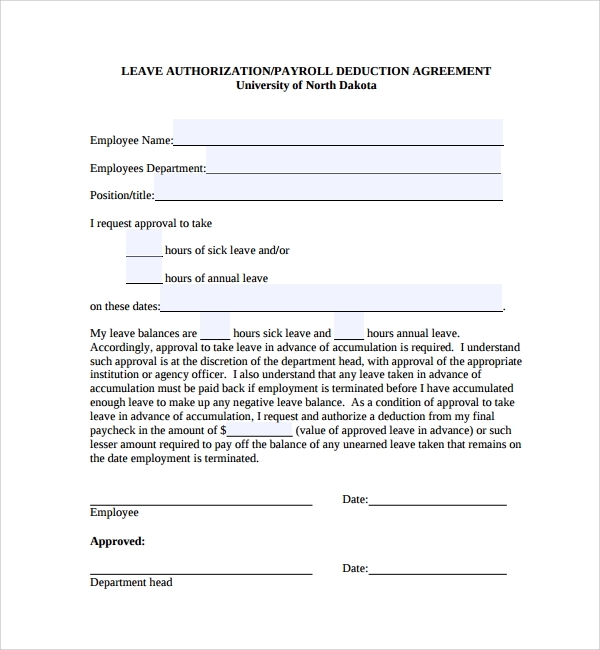 Using these authorization forms, you can easily put all of your leave approval terms and conditions in detail to help your employees understand the tasks they needs to fulfill when they join back. Additionally, you can easily use these templates to define the terms when the company may take a legal action against its employees, in case they don’t fulfill the required statements and conditions. All of these templates come with pre-defined parameters to help a company take several decisions or actions regarding your unexpected absence. 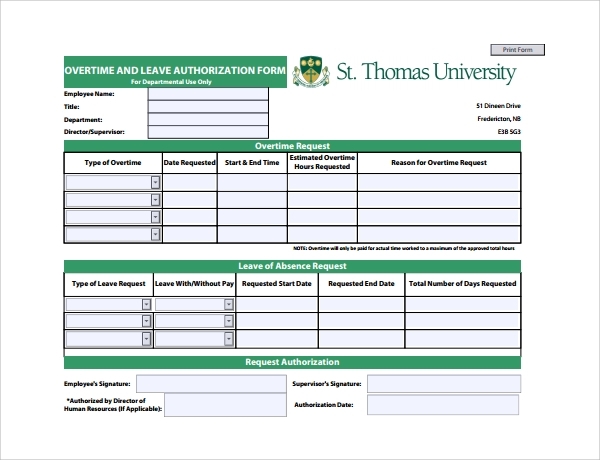 The Leave Request Form Template is ideally deigned and crafted for students and employees who desired to file a leave application for any specific purpose. The template follows a basic format and includes the name of the applicant, roll number and employee ID, To Whom It May Concern, reason for leave, days for which one needs leave, date of application, and other vital details to help you hold a legal proof in case any enquiries, regarding your absence, are made in future. The template is required to be duly filled, printed, and signed by both the applicant as well as the receiver to avoid the chances of denials in case any enquiries are made. 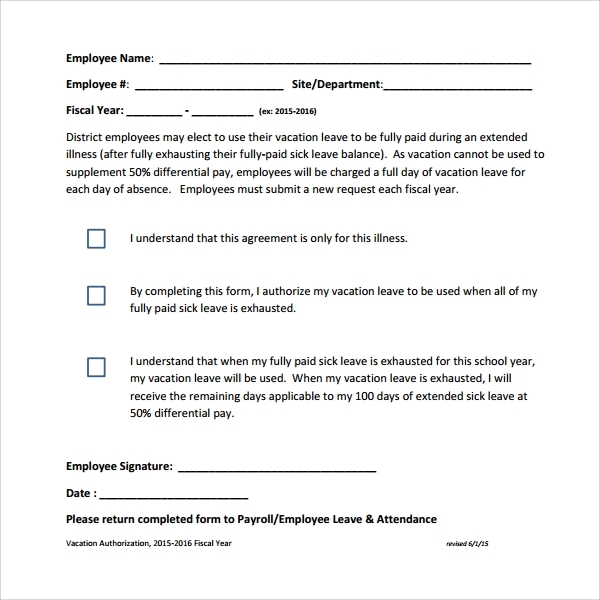 It can be of great use for schools and organizations as their students can employees can easily fill up these printed leave application forms and submit them to the concerned authorities for approvals. The Authorization to Leave Care Form Template is designed to help employees file a leave application for taking care for a family member. The detailed template includes a lot of sections, fields, and blank spaces to help you fill out the medical condition of your family member for whom you’re requesting leaves. 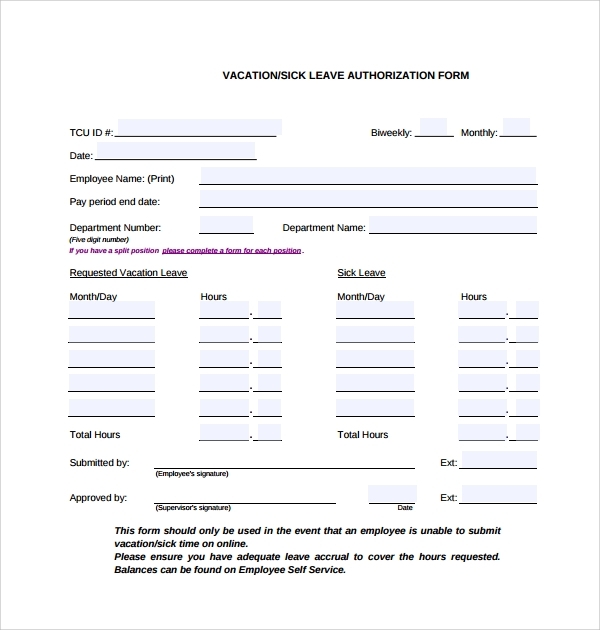 What All Should Be Included in a Professional Leave Authorization Form? A leave application form should be properly filled by the individual and has to be signed or approved by his concerned department, workplace/institute or organization. The template includes all the concerns and basic things that one needs to clarify while filing up a leave application. A professional and well-drafted leave application form must include the name of the applicant, roll number, employee ID, section or class, department or business line, and an appropriate reason for leave. Along with this, a detailed leave request form must include the date of application, number of days for which one needs leave, and it should be duly signed and approved by concerned authorities for validating it and making it acceptable for later referrals. As all employees are entitled to have a leave as per their respective labor codes, you can easily download these readymade templates, fill them with adequate details, and get them signed by concerned authorities. These readymade templates are easy to edit and customize, thus, helps you to request medical, sick, casual, personal, and maternity leaves using a single template. If you don’t know much about the basic leave form rules, then you can easily download these templates and modify them as per your preferences.